It’s no secret that I enjoy connecting with new people on Twitter. Even more so, I really love talking to people who share my passions during Twitter chats. They present us with an amazing opportunity to meet individuals that are scattered across the world & learn from professionals in our field. There are so many Twitter chats to choose from; they will all have a unique community, different pace, various formats and even guest appearances. There’s only one constant with Twitter chats. A lot can be going on in the space of an hour and it’s easy to get overwhelmed! So here are a few tips & habits that I take with me to every chat I join. 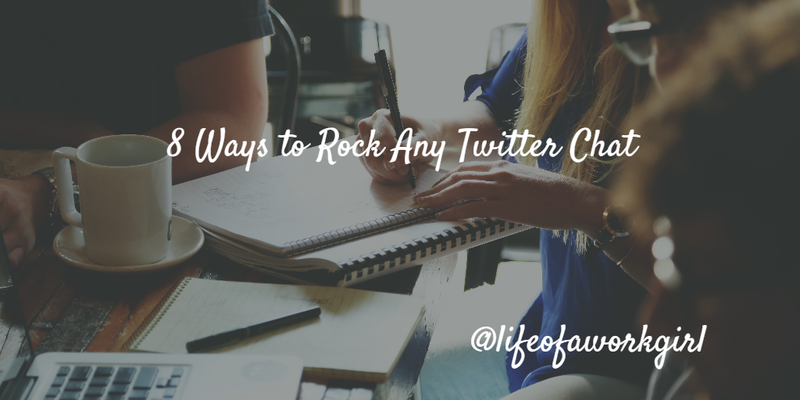 If you’re looking for more chats to jump into, check out this Twitter Chat Calendar. This is a great chance for you to look up any key terms, articles and do a bit of background work before diving in. I really recommend this for anyone that has just started joining Twitter chats as it will streamline your thoughts before hand. If there is a guest, have a look at their website to see where they fit into the industry. If their thoughts resonate with you, follow them! I can’t speak for everyone… but there’s nothing worse than hearing my stomach growl 20 minutes into a chat. If you get up and leave there’s a chance that you could miss out on some great tips. If you stay, your mind will be more preoccupied with coffee, cake and that amazing dinner you’ve planned. Make sure your mind (and body) can concentrate on the task at hand! Have snacks & drinks ready for the hour long tweet storm you’re about to enter! If a particular topic or guest has really caught your attention then this chat may also be beneficial for other people in your community. Why not be a helping hand and retweet the promotion? Not only are you helping your fellow followers, you’re also showing the community that you care enough to help them grow. This also acts as a gentle warning/reminder to your followers that their timeline will get a bit busy! Everyone appreciates a little warning before a Tweet storm. Some Twitter chats are very popular and can stream incredibly quickly. People Skills, Biz Heroes & Buffer chat are just some of many. When this happens I suggest investing in a tool. While following the hashtag on twitter is a great start – it’s hard to share your thoughts & reply to others. I use TweetDeck. This wonderful (free) tool, splits your Twitter account into streams so that you can see everything in real time. I usually have the following active: chat hashtag, notifications & direct messages. This way I can share my ideas, see others & reply to anyone who connects with me, quickly. One of my favorite aspects of Twitter chats is the opportunity to see what other people are thinking. There’s so much more to this than simply answering the questions. Connect with people! Share their tweets, ask questions & most importantly – have fun! It’s so easy to get lost in a side conversation and miss a question but don’t fear! That’s half of the point. You can engage with new people and begin building genuine relationships with them. Give credit where it is due & remember to share your thoughts while respecting the opinions of others. Chances are if you’ve shared someone else ideas, it struck a chord with you! Go back to your timeline & make note of them. I’m a huge tool geek (having new tools to test can really make my day), so I always go back and make a list of people’s suggestions. Also, remember to follow any people that you’ve clicked with during the chat. This is the beginning of building a new relationship & you never know what opportunities may arise. The great thing about Twitter chats is that you’re speaking to people with a multitude of experience & knowledge! You can learn something new from everyone so be as willing to listen as you are to contribute. You’ve learned a lot. These people are helping you to grow. Thank them. The little things can make the biggest difference! People have taken the time to organise the chat, get guests, write questions & speak to the community. Make sure that you make them feel valued. An hour can fly by but with all of the action taking place it’s easy to miss some great ideas. Some people write blogs, others create Storifys – whatever the format, they’re all worth going through. You can get a slightly wider scope of the entire conversation & provide additional context that you may not have thought of. If you’re feeling really creative, why not create your own? Try pulling together your favorite tweets and create a SlideShare or Medium post. It will definitely be appreciated by both the moderator & community! I hope that this helps you to have an amazing time chatting on Twitter. If you feel like I’ve missed anything, share your ideas in the comments section below! Informative post. One thought on Tweetdeck is to also include a column for the chat organizer’s handle. This is especially helpful on fast moving chats like SEMRushChat when you would miss new questions otherwise (it also has the added benefit of helping you to interact slightly more with the organizer so you are “tactfully” in their face and can be picked “out of the crowd”).